The problem of the protected panoramic view of the city from Place Belliard, mentioned in a previous article, surfaced again in 1856, in connection with the renovation plan for the Pensionnat Heger. A key part of it was the incorporation into the building of Rue d’Isabelle 34, 36 and 38, three houses the Hegers had already bought in 1844. Heger, in a letter to the mayor seeking permission, described them as “trois petites maisons.” The first renovation plan was rejected though on the ground that the proposed building got too high, for that panoramic view. The Hegers had to agree to a height of two and a half meters less than the 11,70 m they had wished. That’s one storey. Rue d’Isabelle 34, 36 and 38 were small houses, pretty much identical to the well-known nrs 24, 26 and 28. They were all 17th century buildings. 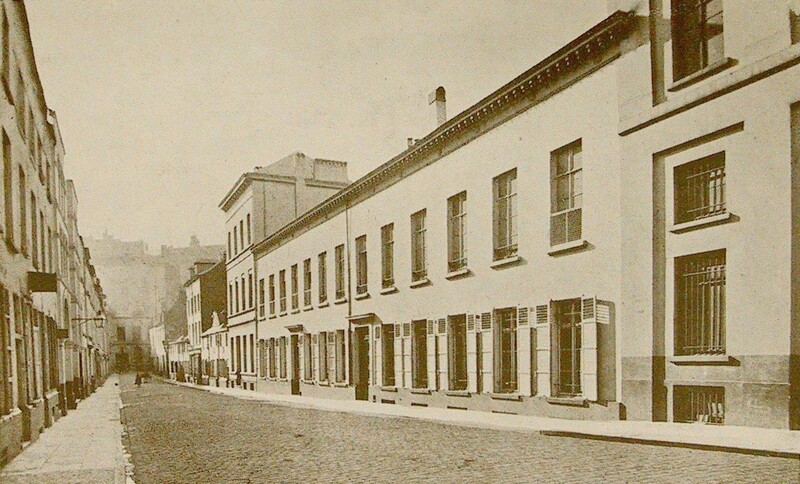 What’s more, in 1842 and 1843 nrs 16, 18, 20, 22, 30 and 40 were most probably also such houses. 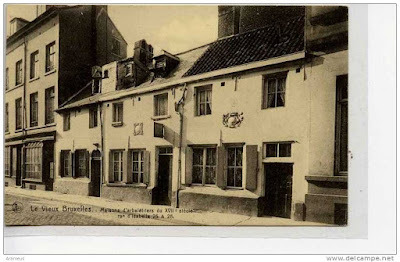 The Pensionnat was nr 32. It was also bought by the Hegers in 1844. 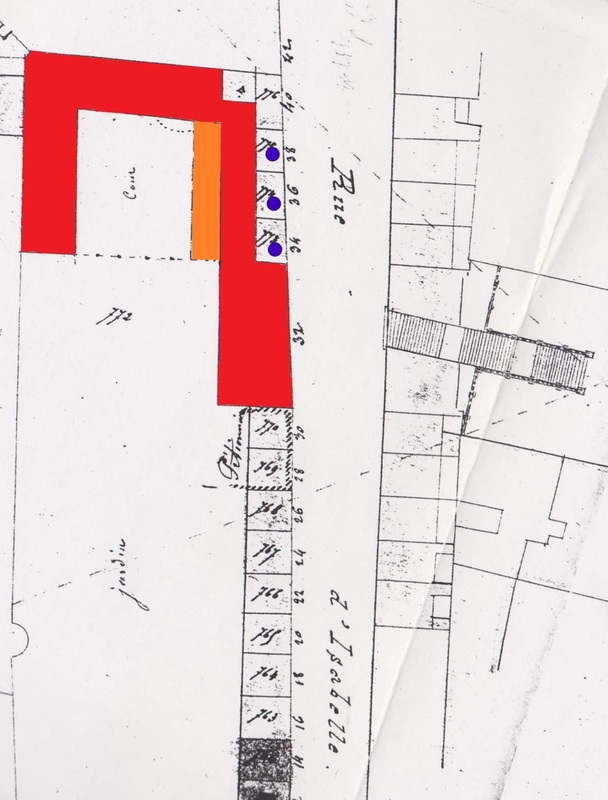 This version of the 1842 cadastral plan shows these three buildings, nrs 34, 36 and 38 (indicated by blue dots; the Pensionnat is given in red, with a part of it, a one storey annex. in orange). They were situated at the right side of the Pensionnat’s street façade. On the left side there was a row of 8 of these little houses. 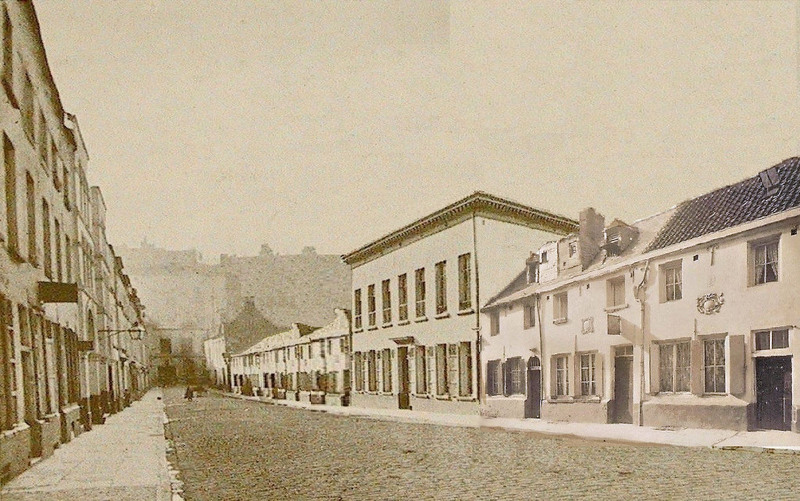 Based on this an adapted picture was made, which comes much closer to what the Rue d’Isabelle really looked like in 1842-3. On this day an art exhibition was opened in Koekelberg. The aim was to raise money for a new local church. “Les dames directrices,” the Journal de Bruxelles wrote on the fourth, “are Mesdames Goussaert, née Phelps, directress of the English pensionnat” and six other women. Two days later it wrote that the ‘beauty and freshness of most of the works excited the attention of all visitors.’ On the 20th l’Indépendant wrote that ‘many curious people go to Koekelberg each day to see the exhibition.’ It added that there was also a large number of works by women. 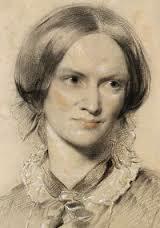 The Brontë sisters may well have visited this exhibition, together with the Taylor sisters. 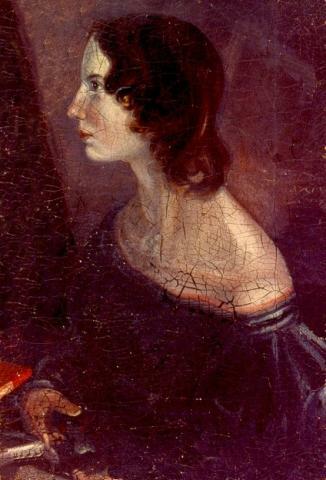 Rachel, accompanied by her mother and brother, left Brussels on this day, for Paris. With her 12 performances in the city and one in Gent she had earned more than 30,000 francs, l’Indépendent wrote the next day. 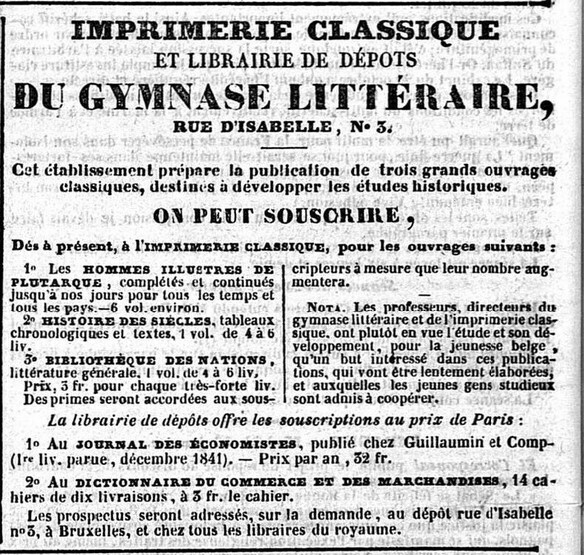 l’Indépendant had four extra pages about the debate in Parliament concerning the city of Brussels which had run into heavy debts. The city wanted to renegotiate the convention with the state of November 1841, which had not worked out well for Brussels. This debate dominated the newspapers around this time. ‘They are going to demolish the pump in the rue d’Isabelle in order to construct a new one,’ l’Indépendant wrote. It possibly refers to the water well in the garden of the Pensionnat. More than 5000 people visited the Salon on this day, including the King and Queen. There were also ever more foreigners who came to see the art exhibition. Paintings were still being added to the exhibition. 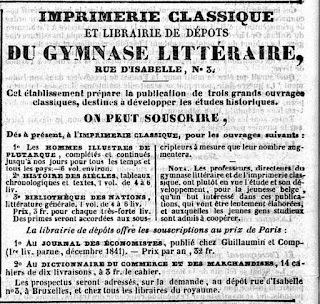 The Journal de Bruxelles had a Rue d’Isabelle advertisement. Rue d’Isabelle 3 (at the corner with Rue Terarken) was also the ‘depot’ for the Paris Journal des Economistes (as the Moniteur belge wrote a week earlier). The Brontës obviously knew this bookshop well. The actress Rachel gave her fourth performance in Brussels. Franz Liszt went to the St Gudule, to judge an organist of that cathedral. The papers wrote he approved. August was a warm month. The maximum temperature for each day of the rest of the month would be at least today’s. During most of it there was almost no wind. The King and Queen arrive back in Brussels, after several weeks in France following the death of the Duc d’Orléans (← July), but before he would find his final resting place, in Dreux on Thursday. Charlotte, on this half-free day makes a drawing of a river scene with trees. She had surely gone out for a good walk, with her sister, one would think. (→ 6 August) Another drawing is dated as probably from this month. 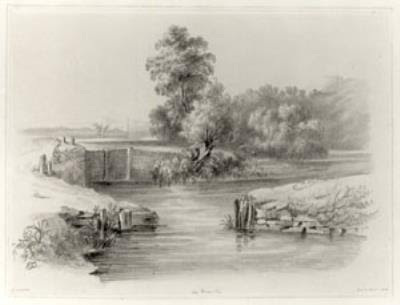 If it is a real view it must have been drawn at or close to the Zenne river, southeast of the city. That much is clear. 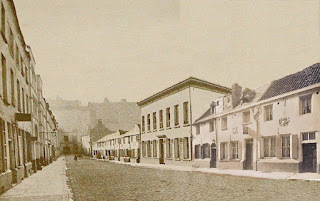 We hope to be able to identify the place later, if it indeed is.